Due to social media and technological advances, people are spending more time at their desks and on their phones. As Osteopaths we see on a daily basis clients experiencing back, neck pain and headaches all related to work ergonomics. Posture is our momentarily body position in space while we are standing, sitting, walking or lying down. There is NO such thing as a perfect posture all the time. But, we can be more conscious of our posture so we avoid rounded shoulders and spine, forward head carriage and a non-neutral pelvis position, which is a common byproduct of desk workers. Poor desk posture can result in headaches, neck, shoulder pain and low back pain. Therefore, postural awareness can prevent common health issues in the long term. Here are our 7 tips to improve your desk posture and workplace ergonomics. Adjust chair position so the hips are sitting above your knees. Ensure both feet are touching the floor and avoid sitting with your legs crossed. Adjust the screen height so your eyes are level with the top 1/3 of the screen. If you use a second screen monitor, angle it slightly towards you. Create a setup that minimises repetitive head turning and focus on moving your eyes instead of your head. Get a chair with lumbar support and press you buttocks back against the seat. Move your forearm and not your wrist when you use the mouse to reduce risk of repetitive strain injuries. Try a standing desk and periodically switch up your standing position to even the load on the feet, knees and the hips. Get up and move off your chair and desk every hour. Remember, the human body is designed to move. Not to sit around for 8 hours a day at a desk. 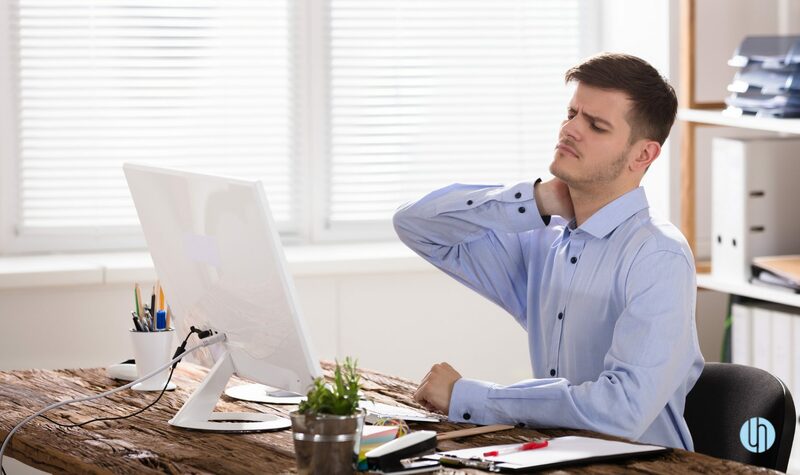 Implement these tips to your work set up on a daily basis to prevent neck and back pain and poor posture. If you are still experiencing neck, back pain or headaches book in to see one of our friendly Osteopaths to help get you back moving again.